Search engine optimization is a process - sometimes a longer process than usual. If you're finding that it is taking Bing and Google a much longer time to index (and thus rank) your website that is reasonable or normal, then maybe you need to do something about it. One tactics of SEOs is to take full advantage of the webmaster-related tools provided by the search engines. Both Google and Bing provide webmasters an opportunity to inform them of new pages that exist and are available for crawling on your website. Submitting your website/pages can be done manually (in the case of Google, "Fetch as Google" under the "Crawl" menu offers 500 fetches; Bing offers a similar "Fetch as Bingbot" but there is no limit [at least that we know of]), but submitting a file known as an sitemap is far more efficient. It enables you to submit all pages at once (those that exist currently, as well as those that will be published in the future). Most content management and e-commerce systems (the software that serves as the platforms for a digital presence) usually offer some means of interacting (submitting a sitemap) with the search engines. If they don't, you might want to look into an alternative. The availability of this feature makes it much easier to submit your page URLs to the search engines. Check with your software provider to discover where your product or content feed is located (otherwise you'll need to build a sitemap manually - more on that in a future SEO Basics article). Once you know that URL of the sitemap file, all it takes is a few minutes to submit it to the search engines. The add site/sitemap submission process at Google is quite straightforward. After entering the URL of the site to add to your Webmaster Tools account, verifying that you're the owner of the site (or at least are approved to manage) is the next step. Google's recommended method is to sign in through your domain name provider (although several alternatives exist including uploading an HTML file, adding a HTML meta tag, or by connecting a Google Analytics or Google Tag Manager account) and it's very easy to do. Once the verification step is completed, submitting the sitemap is the last step. Once the sitemap has been processed (there is a handy test feature by the way that enables SEOs to see if there are any major problems before proceeding), Google will then be able to show details on how your site appears and performs within its index. The sitemap submission process at Bing is just a little more cumbersome than at Google but the project doesn't take long to complete. After completing a form that requests the site name and sitemap location (as well as some other default information), Bing requires that webmasters verify ownership of their site by placing an XML file on their Web server, including a meta tag in their default Web page or by adding a CNAME record to the DNS. 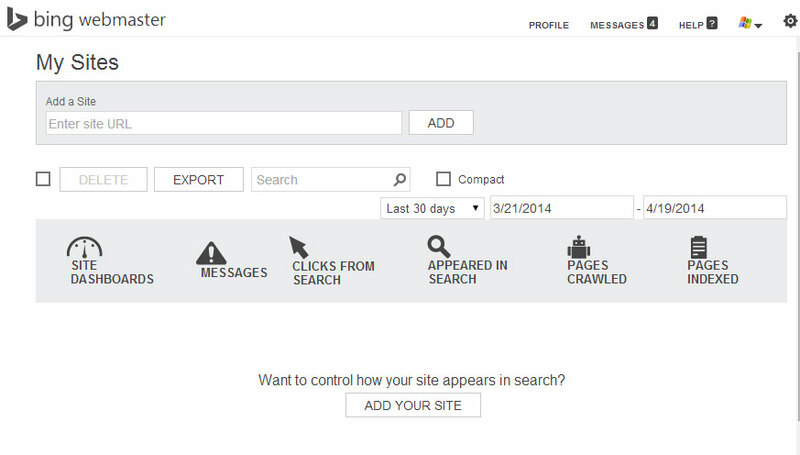 Once verification has taken place, SEOs/Webmasters can then access their site's dashboard. On the Bing Webmaster dashboard, SEOs can see the sitemap they just submitted and after exiting "Pending" status, can then see how many URLs were submitted, the last crawl and current status. Should everything go according to plan, in a few days/weeks, Bing will report on the top keywords from organic search, the inbound links to those pages and a site's activity (clicks, appearances, etc) in the Bing index.